'The Green Room I' is from Robyn Stacey's 1999 exhibition 'Blue Narcissus'. The works are based on the symbolism of flowers: there are 'vanitas' references, as well references to the form, detail and life of plants. Blossfeldt is evoked for his interest in scientific objectivity in relation to depicting plants; as is Bataille for his writing on 'the language of flowers' - their beauty and decay. Stacey plays with the dualism inherent in all living things: their evanescent and fleeting beauty, and their ultimate death and destruction. This interest is not morbid in that Stacey wishes to represent the processes of life and death as being vital to each other and inherent in each other. 'The Green Room I', unlike other works in 'Blue Narcissus', contains no obvious information in relation to the eventual decay of the lotus, the plant depicted. The subtle flare of light emanating from the middle of this work can be read as a manifestation of the idea of sacredness which is traditionally associated with the lotus. The delicate layering of images within the photograph evokes the nature of a lotus pool: cool, calm and quiet. This work was made by placing the plants directly onto a scanner, digitising them and adding black and white and colour photocopies and photographs. Colour and tone was manipulated within the computer in order to produce a final image which is a synthesis of art, science and nature. 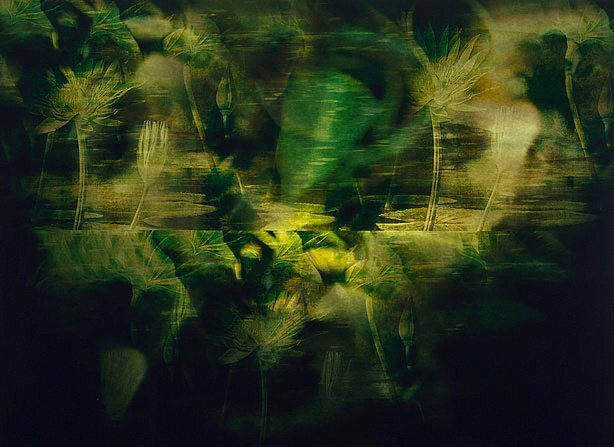 'The Green Room I' achieves a dimensionality which is unusual for a 2D work and it is interesting to note that, concurrently, Stacey is working with lenticular photography in order that the effect of time and movement can be registered within what appears to be a still image. Robyn Stacey has been at the forefront of the utilisation of new media and digital technologies. 'The Green Room I' marks an important point in her work as the fusion of illusion and reality has become truly seamless; the work is not simply beautiful, it is mysteriously so. It encapsulates the history and symbolism of floral references in art without being destroyed by them. Look , 'Focusing on the camera, the art of building the Gallery's photography collection', pg.13, Sydney, Mar 2002, 13.